Happy Halloween, Ship of Heroes supporters! The arrival of Halloween kicks off the holiday season for many of us, and Halloween will be one of the three confirmed special event periods aboard the Justice. Last year we showed off the Dark Magic Blast powerset for Halloween, and this year we’re going to demo two mechanics we plan to have after the launch of the game. This video is a Halloween-themed team combat video. 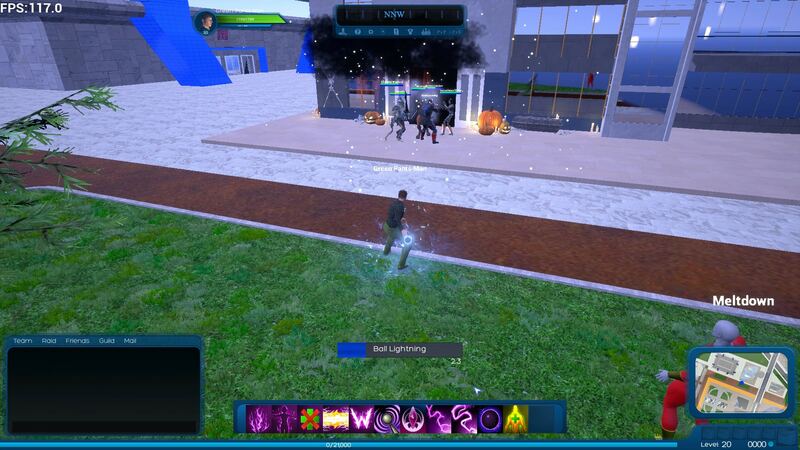 Ambassador, Green Pants Man, Iris and Meltdown are on a team, running through part of the Science Park area to the west of Apotheosis City. They are going on a heroic version of trick or treat. Some doors cause a dark-magic-infused enemy to appear nearby, called a Suspicious Pumpkin. 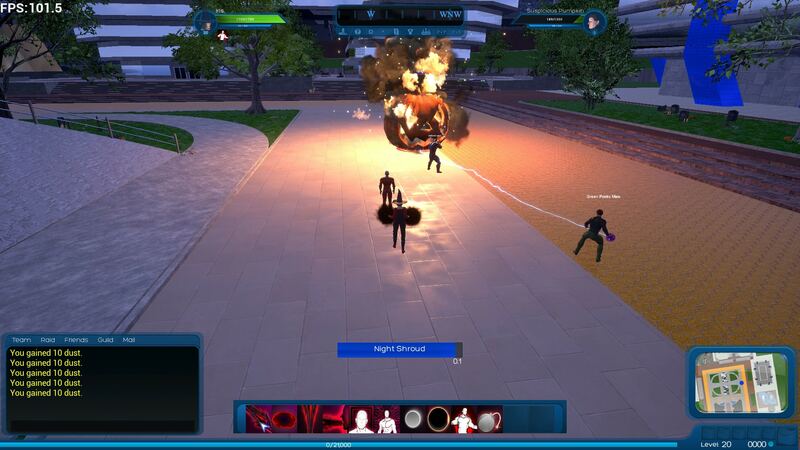 The heroes have a limited time to destroy the pumpkin – and get the loot – before it explodes, potentially killing them. And of course, our team of heroes is going door-to-door. 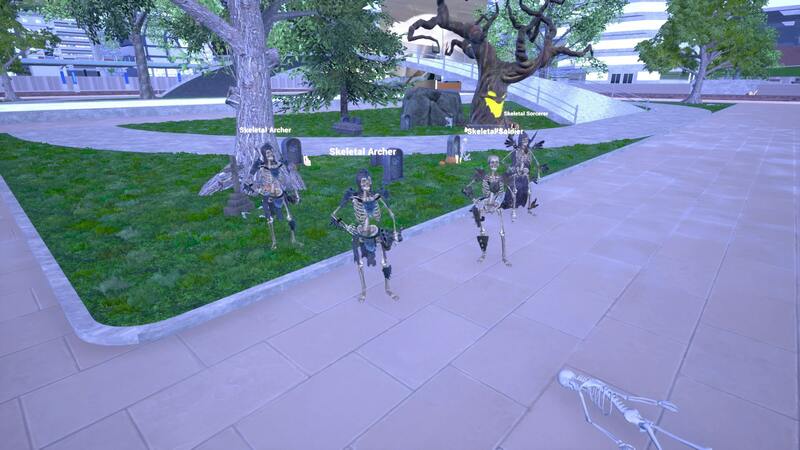 Some enemies only appear this way, during the Halloween Event – werewolves, skeletons, vampiric mercenaries, and evil Prometheans, to be specific. 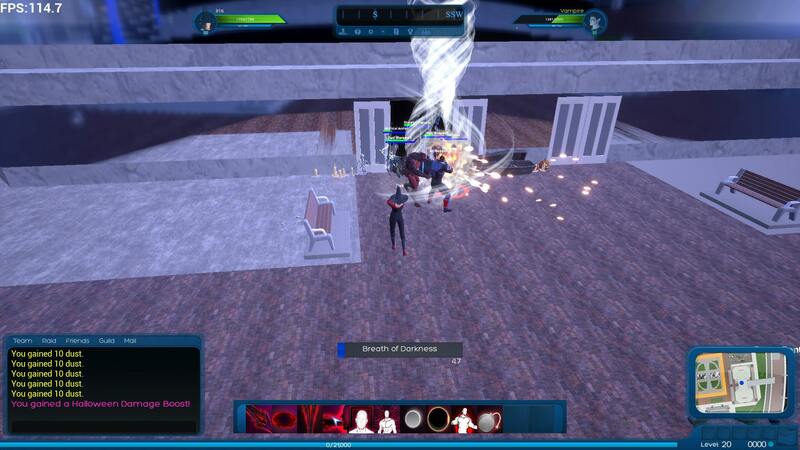 These fights will also drop loot, including temporary powers – which are still under development. We hope you enjoy this video. We certainly enjoyed making it, and bringing you into the new galaxy that we are creating together. Skeletons make good Halloween enemies. Thank you, and we hope this is just the beginning of a wonderful holiday season for all of you. This is the first in-game reveal of our planned Halloween event for Ship of Heroes, although we expect to significantly expand the event after launch of the game. Two new mechanics are being shown – defusing evil pumpkins infused with dark magic, and going door-to-door in a trick or treat mode. We’re also showing placeholder temp powers as one of the rewards for holiday events, although we have not created the specific powers yet. Unusual loot is available in the special events. 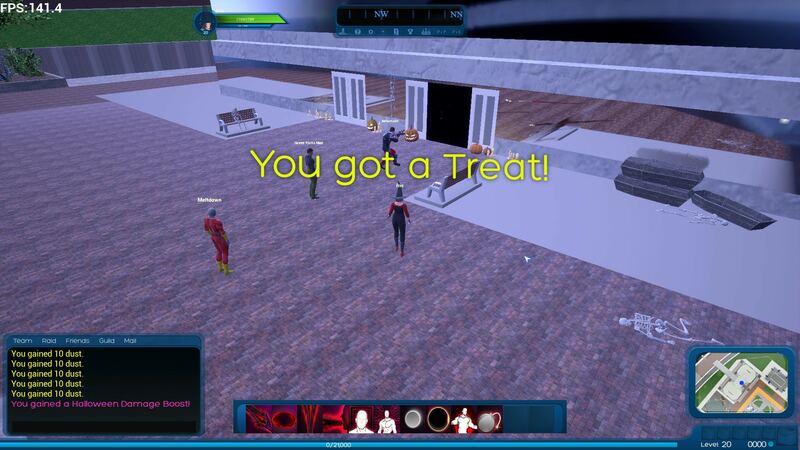 On Halloween, doors in Apotheosis City will open once for each player, but they must be reset by being opened by another player before they can be clicked successfully a second time. There is currently a one-minute delay between door clicks coded into each door to encourage teams to go from location to location, but we intend to seek feedback on the right time interval. The werewolf and skeleton monster models were purchased, and we think they are quite good. 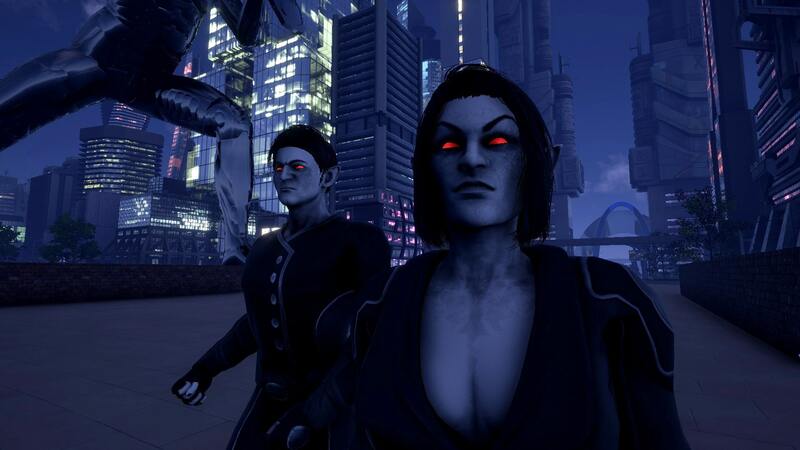 The vampiric mercenaries are a future group that have… mostly volunteered to be transformed into vampires so they can be more effective fighters. The Prometheans, as previously described, are infused with an insanity-producing combination of tech and dark magic. This particular video was produced in-game, in a packaged client-server arrangement. This choice gives us the same kind of results as a player would experience while playing the game. We used IBM Softlayer for the server this time. Combat as the devs see it in testing. 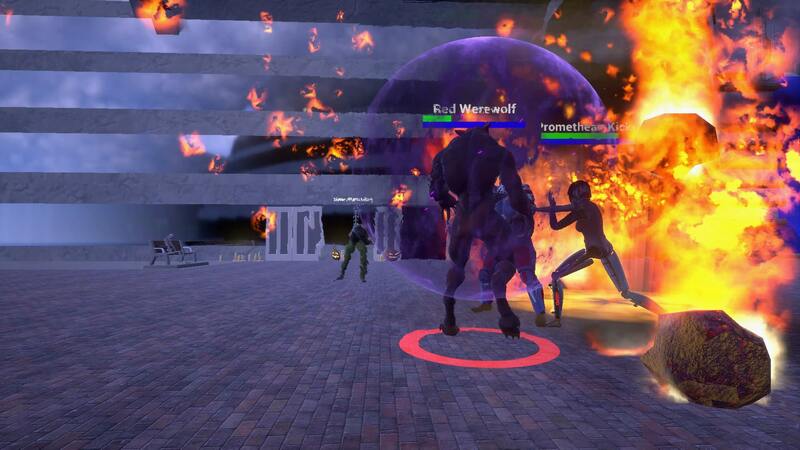 Note that during our dev testing we had Group member HUD elements and damage number texts temporarily disabled. This is the first time we show combat at night. 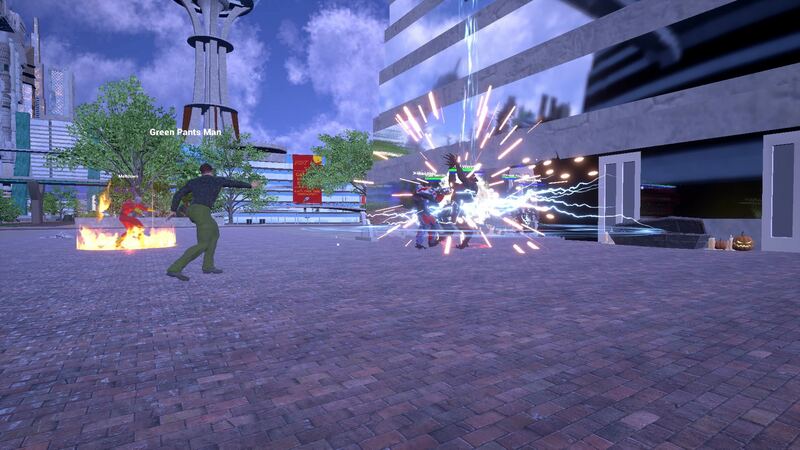 We are still refining the FX of the powers to look good without at all times of day without a big FPS drop. Some powers like lightning are going to look better at night. FPS is pretty good in this test run. Particle FX and animations are not final at this time. Some of FX and Animations being displayed during the video are placeholders until final assets can be developed. The FX are all provisional. We’re looking at shots like this to guide adjustments. This video has footage from several of the practice runs our dev team did prior to recoding this video. Also, the footage is from multiple devs, each with a different computer. In these scenes we have the FPS shown dynamically in the upper left hand corner. The FPS numbers are very good, but then, there are only four heroes and a handful of enemies on the screen at a time. We place a lot of emphasis on trying to get acceptable FPS numbers throughout our development process, as we believe it is very difficult to improve FPS late in development without damaging the art quality of the game. But these numbers are still extremely good. The next things we plan to show to the community are some details of our FPS improvement process, and a Login Test. We also have several new costumes to share with the community.